Room For 20 Passengers, 22″ Chrome Wheels, 4 bars with champagne glasses and rocks glasses, & 5 champagne holders. Two huge 32: Plasma HDTV’s, Two 20″ Plasma TV’s, Two 7″ LCD TV”s, Private VIP lounge in back and 20″ Plasma TV, DVD Player, SM Radio, I-Pod Hook Up, Sony Playstation 3 with wireless controls, State of the art LED and fiber optic light show, LED disco floor and disco ceiling, shag carpeting, full length mirror ceiling with fiber optic lights, 3000 was sound system with heart pounding bass, Exterior strobe and LED lights. The latest model of SUV Escalade 165″ stretch! Accompanied by the perfect combination of fiber optic lighting, multiple large LCD TV’s, touch screen controls, surround sound, large seating capacity and much more. This stretch SUV limousine seats up to 16 people and has a fabulous vip section in the rear. Perfect for large weddings, bachelor or bachelorette parties! The little black dress of the industry! 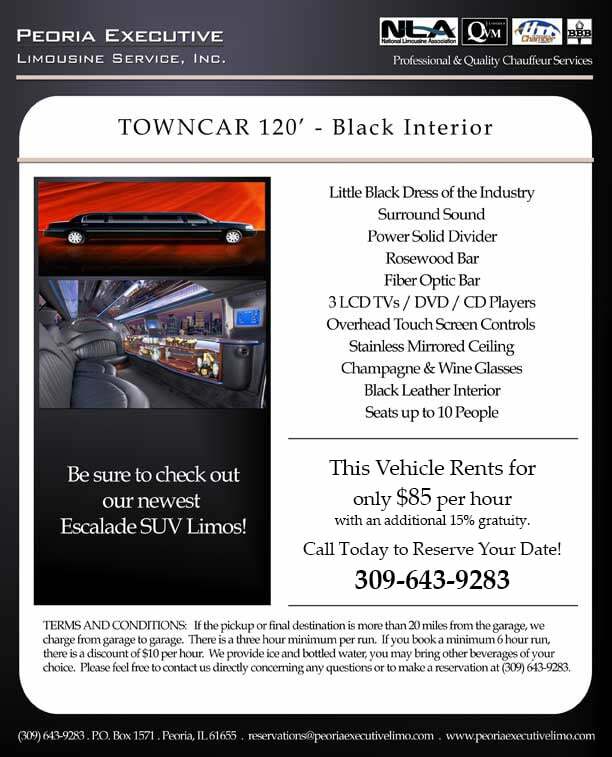 This 120″ limousine is equipped with Surround Sound, Power Solid Divider, Rosewood Bar, Fiber Optic Bar, 3 LCD TV’s, DVD, DC player, Overhead Touch Screen Controls, Stainless Mirrored Ceiling, with Fiber Optics, Water and Ice (Provided), Decanters, Champagne Glasses, Wine Glasses, Rocks Glasses and Black Leather Interior. 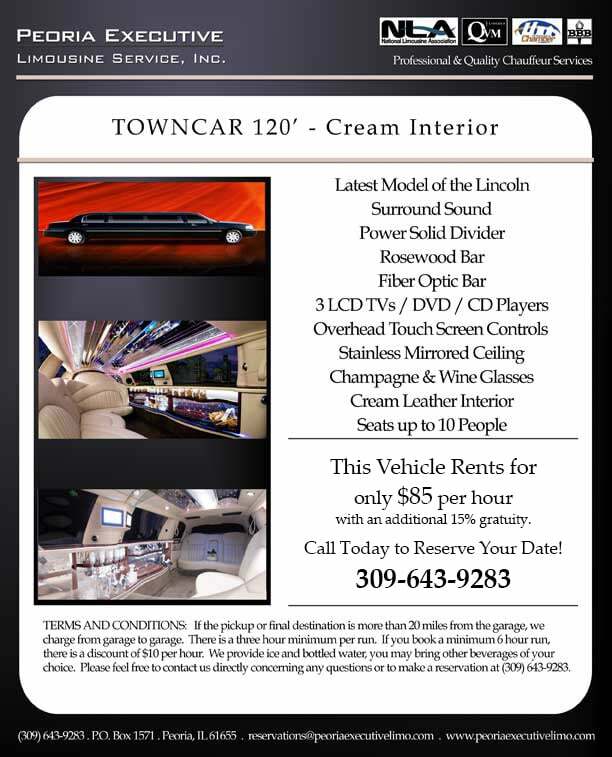 The Lincoln Town Car 120″ is the latest model in the industry and comes with all the features of the black interior version. The only difference is the cream leather interior. Our stretch limousines are the cleanest, well-maintained vehicles in Peoria!